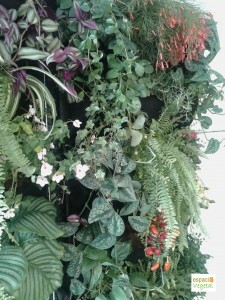 This week we have designed a new vertical garden, with a wide variety of plants, decorative, aromatic, orchard and floral, and this has been the result. Every day we study what are the most appropriate plants to create our vertical garden, in different environments. 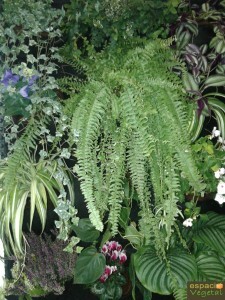 In a room like the living room of the house, being inside can be used in vertical gardens, plants little substrate called air, such as mosses, lichens, ferns, also crasulas, sedum, echeverrias or karanchoes because they are low maintenance and They bring a particular texture, if we can add a splash of color to any flowering plant. Vertical gardens Natural Pocket www.espaciovegetal.com system also allow us to change the design of our garden as we want, right by the station where we are, either decor we want at a particular time, or just for that we like to change. With its practical bags planting it is very easy. Color: Plants that give color to our garden with flowers, leaves or fruit. Fruits: They are not so necessary but it can also bring color to the garden. Form: plants that can give vertical forms, or the way we want are needed. Aroma: Primarily for vertical gardens inside the house, always welcome in our inner garden of our house aromas of nature. Geotextile design pots for decoration and planting.